Hideo Kojima's worldwide games company tour is well into its second year with the Metal Gear creator stopping in at Valve. The games industry icon posted on Twitter (below) a series of pictures of him at the Washington-based PC giant, leading to further speculation of his upcoming and, um, 'interesting' project Death Stranding would be coming to Steam. 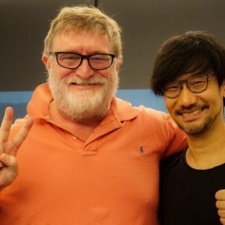 When Sony announced that it was funding a new iteration of Kojima Productions following the developer's very public and very vitriolic exit from previous home Konami, the firm said that his upcoming game would be coming to PC after a PlayStation 4 launch in a press release. Up until now, there's been little to no information about the PC SKU. That said we could just be reading too much into these pics - Kojima might just have swung by to claim one of those elusive Steam press accounts that used to do the rounds. Who knows. Interestingly, this is one of the few non-Sony studios that Kojima has visited since joining the firm. When he first launched Kojima Productions, the developer toured round a variety of outfits including Guerrilla and Sucker Punch. Death Stranding is now being built on the former's Decima engine. 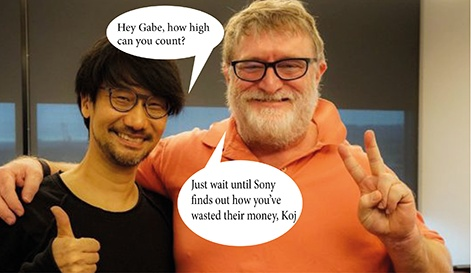 Update: Wait, we have breaking information from sources on the ground at Valve have confirmed what words were exchanged between Newell and Kojima.